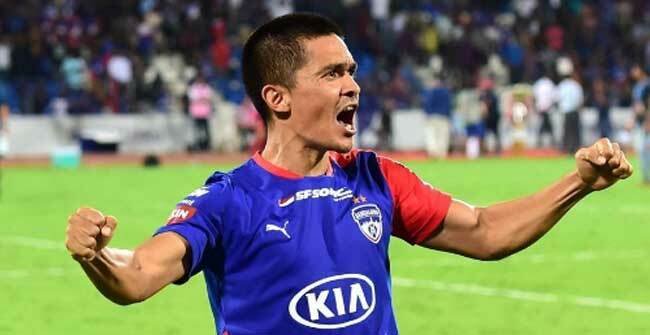 Mumbai, Mar 18 (PTI) An elated Bengaluru FC skipper Sunil Chhetri termed his team's maiden Indian Super League victory against FC Goa as a "sweet one" especially after his side had faltered in the summit clash last season against Chennaiyin FC. "Last year after the final, I said next year we'll come back. Right from the ball boy to Carles (Cuadrat the coach), everyone wanted this. We wanted to win it (the title) badly. When you lose the way we did last year, it's sweet to win this one. Asia, we are back," Chhetri said at the post match media conference late Sunday night. Now by winning the ISL, Bengaluru FC will play in the AFC Asian Cup next year. Chhetri also said it was "commendable" that a player like Ferran Corominas, who bagged the Golden Boot award, did not get any chance against his team on all the three occasions when the two teams clashed. "The message from the coach was that we should try to attack but as soon as we lose the ball, we should fall back and defend and have numbers (at the back). For players like me, Miku and Udanta (Singh), it was not easy because we are attacking minded people," Chhetri said. "I am happy we did it because Nishu (Kumar) and (Harmanjot) Khabra got that security when Udanta and I traced back. It is commendable that a player like Coro (Corominas) did not get open chances against us in three games," he said. "Last year, we conceded off set pieces and we were dominant until those two goal, so we were sure on not letting it happen today," he added. Asked where he would rate this win, Chhetri quipped, Top-two. Number 2." The winning coach Carles Cuadrat said that the team was trying not to take the game to the penalties as then it can be anybody's game. "We were trying not to get into tie-breaker as it then becomes a lottery a lot of times. We are happy that one ball in the box gave us the victory. This is the seventh goal done by a set-piece and it shows how important set pieces are in the game, Cuadrat said. Meanwhile, FC Goa coach Sergio Lobera termed Ahmed Jahouh being sent off the field after earning a red card as the key moment of the match. "The key moment was when were reduced to 10-men in the first half of extra time. It was a very tight game was going to be a matter of small details and the sending off was a big handicap for us," Lobera said. Despite the loss, the FC Goa head coach said he was proud of his players . "Till today, we were focused today only on this game (the final). From tomorrow onwards, we will start working towards the (upcoming) Super Cup. I said to my players in the dressing room that I am proud of them and (what) they have done in the season. "I am thankful to the players and they have been very professional. It is sad that we cannot take the trophy to Goa," he noted. Meanwhile, Lobera's name has been 'linked to' the vacant India coach job and specifically asked about it, the Spaniard said, "(It is) always nice to be linked to national team of a great country like India, but I have one more year contract with FC Goa.